Tag line: "Public Enemy No. 1 of all the world"
My first experience with 1934's The Man Who Knew Too Much occurred right around the time I was getting serious about film. I rescued a videotape copy of it from the bargain bin at K-Mart, and certain I'd heard its director's name before, immediately went home and popped it into the VCR. While many will argue Hitchcock's 1956 remake is the superior work, I'll always hold a special place in my heart for this particular version of the story. Bob and Jill Lawrence (Leslie Banks and Edna Best), along with their daughter Betty (Nova Pilbeam), are vacationing in Switzerland, enjoying all the wintry locale has to offer. While there, they befriend a skier named Louis Bernard (Pierre Fresnay), not realizing he's actually a secret agent. One evening, as he and Jill are dancing, Louis is shot in the chest, but before dying, whispers to Jill the details of an intended political assassination, to be carried out in London in a few days time. Unfortunately, the conspirators, led by a man named Abbott (Peter Lorre), witness the exchange, and to ensure Jill remains silent, kidnap Betty and whisk her off to London. Fearing for their daughter's safety, the Lawrences frantically pursue the kidnappers, revealing nothing of what they know to the authorities. 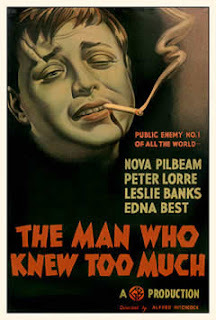 The Man Who Knew Too Much was Peter Lorre's first English-speaking role, and he does a fine job playing the heavy, almost identical to the kind of villain that would make him a fixture in Hollywood for years to come. Yet what makes this movie such a fascinating watch is its an early example of a “Hitchcock“ film, the type that would soon earn its director the title “The Master of Suspense”. A taut thriller (clocking in at a mere 75 minutes) The Man Who Knew Too Much is the archetype Hitchcock story: an innocent man (or, in this case, family) pulled into a desperate situation by a string of coincidences. There's a generous portion of humor as well, not to mention plenty of excitement, culminating in a tense scene at the Royal Albert Hall, where the assassination is to take place. Hitchcock himself preferred his 1956 remake of The Man Who Knew Too Much to the original, telling Francois Truffaut, “The first version was the work of a talented amateur, and the second was made by a professional”. Be that as it may, this earlier interpretation offers a rare opportunity to check out the “Master” at the beginning of his career, while he was still cutting his teeth. The fact that it's a fun film to boot is a nice little bonus.